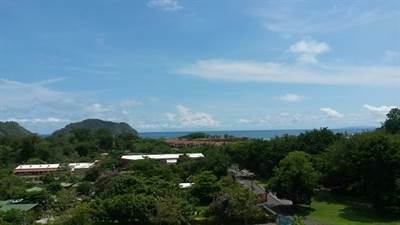 This is an excellent option if you would like to own a fully equipped 2 bdrm ocean view condo right next to Los Sueños Marina, but want to pay a fraction of the costs that you would pay in Los Sueños. This is a 7th floor condo in Herradura, about a half mile to the Bay and across the street to Los Sueños, home of Costa Rica’s best Marina, golf course, Marriot, luxury residences and shopping. 1 hour drive time from Capital city of San Jose, and only 10 minute drive to Jaco. Plenty of shopping, amenities, fishing, surfing, nightlife etc. in this growing area of Central Pacific, Costa Rica. This condo is 1100 square feet with ocean and mountain views from every room. There is a balcony off of both bedrooms and the living room, (including a romantic, charming, separate private sitting area off of the master bedroom). Kitchen is fully equipped with granite counter-tops and plenty of cupboard space, living room has large flat screen and comfortable furniture. Guest bedroom and guest bathroom, Master has it’s own en suite bathroom. This property is sold fully equipped w. everything. This is a great location to live and unit is easily rented. Low HOA Fees of $300 a month, includes upkeep on all common areas, pool and BBQ area, 24 hour security, private parking. Property/rental management available. Beautiful North American style home (w. open floor plan) in fantastic condition in an area that is just a mile to Esterillos Este beach. 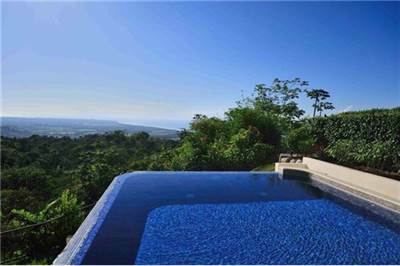 All you could ask for in your Costa Rica dream home, beautiful big lot, highest quality concrete block construction, awesome swimming pool and deck areas! Great Room has high vaulted ceilings, den, dining area, and large kitchen area with expansive granite countertops. There is a huge backyard of over 15,000 square feet (1500 meters) with private swimming pool and green areas. There are three bedrooms, three bathrooms. Master bedroom is huge, with an en suite bathroom with his/her sinks and shower and separate Jacuzzi tub as well as walk-in closet. Sliding glass doors open up to glorious swimming pool and backyard. The other two rooms are also spacious with closet space and a second bedroom with en suite bathroom. This property is sold with everything included and is in excellent condition, NO HOA FEES, but private and secure. The builder of this home, who also offers property management is located about 100 yards away from this house! An “embarrassment of riches” as far as beaches, natural environment, and outdoor activities away. Only a few miles to bars, restaurants and shopping, as well as only 15 minute drive to Jaco, 2 hour drive to San Jose, 45 minute drive to Manuel Antonio National Park beaches. Call me or write for more info. • 1000 sqft , 1 bath , 2 bdrm 2 storey – FOR SALE USD99,000 . MAKE AN OFFER! SUPER AFFORDABLE! 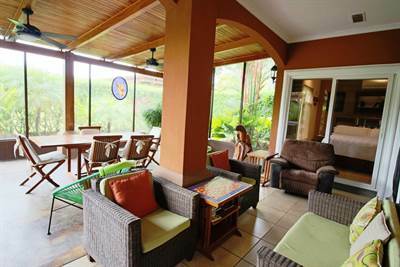 Quaint little 2 bdrm tropical getaway in Herradura, Costa Rica, near all the activities of Jaco and Herradura as well as the Los Sueños Marina and Resort just minutes away. This home is owned by owner from USA who has remodeled the home to make it neat, functional and comfortable. This is an excellent opportunity to take over a property that has lots of potential for vacation or second home, There are no HOA fees, most neighbors are locals, and caretaker lives across the street (if needed). All roads to property are paved and area is super close to everything. 300 square meter lot (3228 square feet) has room for another two structure if desired. Owner is selling this charming property fully furnished, turn-key, and motivated to sell quickly. 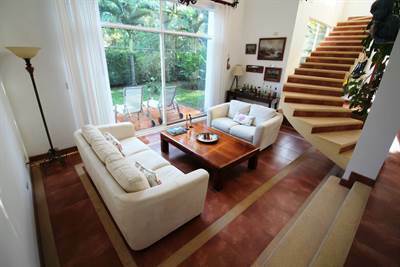 Brand new listing of customized home “CASA PACIFIC DREAMS” located in a well-established beautiful gated community only 200 meters to the beach in Playa Bejuco, Costa Rica. This home is meticulously and lovingly cared for by current owners, and it shows! This home has three bedrooms, two full baths, spacious and impeccably kept living areas in an open floor plan w. dining/kitchen/family room, one car garage, and a recently-built fabulous back patio addition of solid teak beams and roof, and acid stone-wash cement floor. The third bedroom is set up as an office with desk and full sized wall unit. There is also a Futon that also folds down into a bed in the office. All bedrooms, bathrooms, main living area and patio have ceiling fans for comfort, (10 fans total). The entire house and garage have high efficiency LED fixtures to provide less heat and less cost. Bathrooms feature European frameless glass shower enclosures, and granite topped vanities, the master bedroom has a “sleep by numbers” California king sized bed with Oak bed frame and second bedroom has a queen sized bed. counter tops, tile behind the stove and an under counter water filtration system. All (4) AC units are new (July 2017) and they are high efficiency inverter units and the condensers were moved up onto the wall for better protection from dirt, moisture, etc.The living room has a new 55” Sony Bravia (4000p) flat screen TV with a new Denon Home theater system with speakers. There is a water pressurization system to provide constant pressure during the months of high demand. Also, there is a fully automatic full yard sprinkler system to keep the yard green during the dry season of the year. The very large back patio (400+ sq. ft.) is all constructed of teak. Teak columns, rafters and ceiling with (3) ceiling fans. It is all screened in to protect from insects and a new roof. It has a brand new gas grill. Sit on the patio and listen to the surf breaks on the pristine beaches of Esterillos and Bejuco, only 200 meters away. The garage contains a full size stacked washer and dryer. Also a newer “instant hot” water heater. There are built in cabinets and work bench. The driveway has been expanded to accommodate two cars and a golf cart. This gated community has two beautiful pools, tennis court, and 24/7 security. all set in a beautifully landscaped setting of lush flora and fauna. Very low HOA fee of $200 a month includes all common area expenses, security, on site managerial staff, and gardener. The asking price is $249,995.00. In addition to the house also available (separately) are a Golf Cart and SUV, both in new condition, call or write for more details or to set up a showing of the fantastic Casa Pacific Dreams! 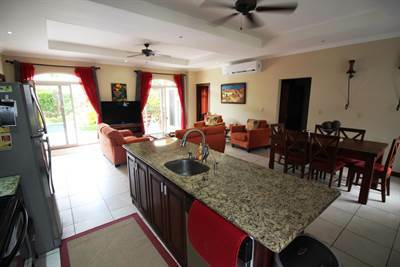 • 221 sqm , 3 bath , 3 bdrm bi-level – FOR SALE USD425,000 . This Costa Rica masterpiece is absolutely stunning inside and out. One of my favorite properties EVER in this area due to it’s superior quality construction, finishes, design, furnishings, and the best part… the world class views of the Pacific Ocean and jungle covered hills. It is now being offered at a highly motivated price point due to health issues of elderly North American owners. This home is still in new condition and meticulous care has been spent to keep it this way. 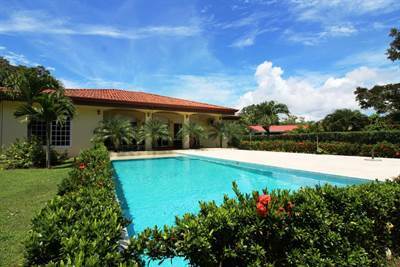 Situated on a nicely landscaped quarter acre lot, high in the hills above Hermosa, with wonderful views and cool breezes, but which is only 15 minutes away from the beach and the city of Jaco. Fully fenced, Security system, lovely infinity pool, and neighborhood security service offered if you are out of town. This is optional, there are no regular HOA fees. Details of house: No expensive has been spared, and built to the very highest of North American standards. Entrance on main floor opens to high vaulted ceilings, custom Hunter-Douglass blinds and screens throughout. There are floor to ceiling windows throughout the house, making it very light and airy as well as accenting the incredible views. Main Floor: entrance hall steps down to large and open living room-dining room and kitchen area. Also on this main floor are 2 bedrooms, each with en-suite bathrooms and separate powder room. Master bedroom has a separate large walk-in closet, a bathtub and a walk out shower to deck and pool area with stunning views. Kitchen is well equipped with top grade stainless steel appliances, microwave and water filtration throughout the house. There is custom made teak furniture throughout adding to the showcase quality of this property. Downstairs. 3rd Bedroom is currently used as a man-cave, easily converted to bedroom, den, or study, with a custom made Murphy pull-down bed. There are plenty of built in cupboards, luxury reclining chair, bookcase, full bathroom and secure storage area. Sliding glass doors from this 3rd room open to downstairs garden “nature trail”, patio and pool. There are individual air conditioners and fans in each room. Extras include flat screen TVs, back-up water storage tank, water filtration system, gardening equipment, outdoor furniture etc. BIG BONUS is the roof top deck for stargazing, sunsets, morning coffee, or happy hour! The owners hope whoever purchases their house, enjoys it and treasures it as much as they have and have kept this property in pristine condition for new owner. ALSO, There is another quarter acre building lot adjacent that is can be purchased for an extra $75,000 to double the size of the property. This would be a great area for a guest house or rental unit. This spacious 3 bedroom, 3 bath home was built in 2009, constructed with steel reinforced concrete block, and luxury finishes. This setting of tropical splendor enjoys ocean and mountain views, and is located in a gated community just a few miles from the beautiful beaches of Esterillos and Bejuco, Central Pacific, Costa Rica. This home is situated on a lot of 24,000 square feet (over half an acre) with beautiful views, garden area, fruit trees and local flora and fauna. There are two bedrooms with en suite bathrooms, the master bedroom is upstairs and features fantastic views, a balcony, and a huge walk-in closet. There other “master” bedroom is downstairs and is a great option for those wishing to avoid stairs. There is also a third bedroom downstairs that is currently being used as a den with a leather couch (has fold out bed) and lounge chair. There are flat screens and wi-fi throughout. This is a great opportunity to own a beautiful, spacious three bedroom/three bath home with private swimming pool and large yard, at an incredible buyer’s market price point. 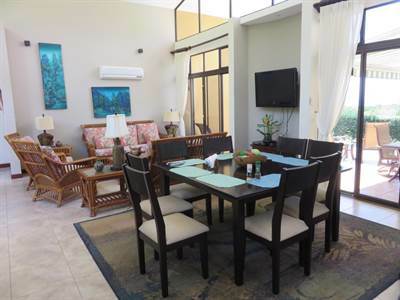 This property embodies tranquility and quality, the setting is a quiet escape into tropical beauty, yet all within a few short minutes of the beach city of Jaco, and the marina resort at Los Sueños. Easy access to all the amenities the area has to offer, but feel like a world away in your private oasis. Large windows and several sliding glass doors allow great natural lighting as well as easy and plentiful access to the backyard pool area. Large Master bedroom features direct access to the pool area, en suite bathroom as well as large walk-in closet, 2nd and 3rd bedroom share a “Jack and Jill Style” full bathroom, with doors entering from each room. This home was built and designed by an Italian builder and is extremely sturdy construction with all steel reinforced concrete block. The owners have kept this property neat and clean, and in excellent condition. The large measures 898 square meters (9700 square feet), and the backyard is a perfect size and location for pool parties, barbeque (there is already an outdoor sink and storage area), or just relaxing and soaking up the plentiful sunshine. There are local fruit trees, coconut trees, and a large storage bodega as well. A large wall encompasses the property, adding privacy and quiet. This home is sold fully furnished and has rental income history as well as property management in place if needed. This neighborhood features jungle covered hills, farms, and splendid flora and fauna, accessed by a newly paved road. This area is secure and clean and there are no monthly HOA fees. 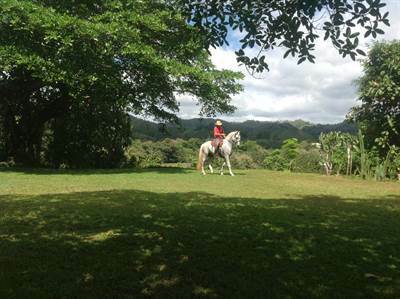 It is an approximately five minute drive to all the amenities of Jaco, yet feels a world away. Motivated owners have priced this property to sell quickly. There are not many homes of this quality at this price point and ideally located so close to Jaco, so contact me as soon as possible for a viewing of beautiful Casa Mia! White Sand Beach House in Punta Leona, Garabito is Sold! 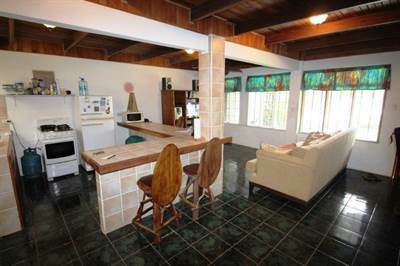 in Punta Leona, Garabito The bi-level at White Sand Beach House has been sold. Posted on October 9, 2017 Author Jaco Area PropertiesLeave a comment on White Sand Beach House in Punta Leona, Garabito is Sold!